The H5N6 virus was first reported 20 months ago in Southern China, and during the first 19 months China reported a total of four human infections. While the virus has been sporadically reported in poultry in both Vietnam and Laos, no human infections have been reported outside of China. Two weeks ago, Guangdong Province reported a human infection (see Hong Kong Notification: Fatal H7N9 Case In Guangdong Province), followed just last week with Guangdong Province Reports 2nd H5N6 Case In A Week. Today Hong Kong's CHP is reporting a 3rd case in neighboring Guangdong Province. While three cases does not an epidemic make, this sudden increase in reported cases is certainly something to watch. The Centre for Health Protection (CHP) of the Department of Health (DH) was notified of an additional human case of avian influenza A (H5N6) by the Health and Family Planning Commission of Guangdong Province today (January 7), and again urged the public to maintain strict personal, food and environmental hygiene both locally and during travel. It involves a man aged 25 in Longgang, Shenzhen, currently hospitalised for treatment in serious condition.? From 2014 to date, a total of seven human cases of avian influenza A(H5N6) have been reported by the Mainland health authorities. It is worth noting that a couple of days ago Hong Kong announced H5N6 Detected In Dead Egret, making the 4th such detection in wild or migratory birds in the new territories. H5N6 is one of the new reassortant viruses to come out of China since 2013, a list that includes H7N9, H5N8 (and its reassortants), and H5N6. 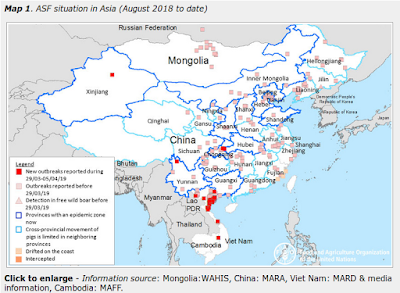 Of these, H7N9 has infected the most humans (roughly 700), while H5N8 - which has not infected humans - has spread the furthest afield (making it to Europe, Taiwan, Japan, and North America).